The Meeting at Minsk produced warnings from out of the blue. The EU warns Russia to descalate the conflict at the Southeastern Ukraine, completely ignoring Putin’s declaration that this conflict is none of his business. It is Ukraine’s business. The Eu gave him a deadline to do this, though, even when they know that it is actually the Kiev army that is doing the shelling. Another warning was aimed at Poroshenko, that he is to ensure EU receives the supply of gas from Russia. And so it is actually Poroshenko that is on the squeeze. He must get Russia to open the spigots from Russia, but Russia says Ukraine must first start paying the gas debt to Russia, and then there will be a $100 discount, if and only if Ukraine starts paying off its debt. If I remember correctly, the amount Ukraine received from the IMF recently is a little bit more than the first payment of this debt. Perhaps it is time for me to add this—-to stop the conflict in Southeastern Ukraine, give the regions in question statehood within Ukraine, or that statehood which will be accepted by the UN. (you never can tell if they won’t). In other words, federate Ukraine, and give Donetsk and Lugansk statehood within the federation. Now this is not a bad option., It should work well for EU, Ukraine,and Russia. Right now, Russia will not flinch should Ukraine join Nato. But there will be no gas subsidies for Ukraine because it will now be treated by Russia as a foreign country. Ukraine may be able to choose which icing it would get, but it will still have to pay for the cake! The planes are all gassed up. But orders to move don’t come down. simply because there has been no plan presented. The Pentagon is stumped and not by its own making. simply because there is no backup from EU. the military might of NATO teeters towards extinction. 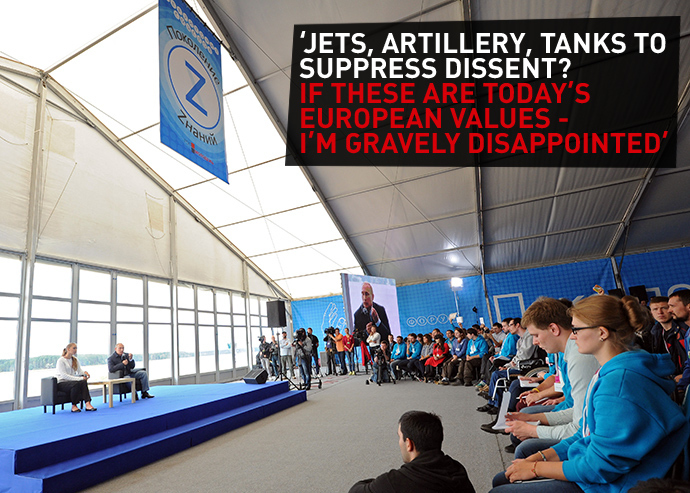 The NATO Secretary general’s position has become untenable. complete with fabricated videos and satellite images. The US makes more threats to Russia. Kiev makess more provocations to Russia. They are wasting their breath. and does not succumb to threats. He does not have a anything to do with the southeastern Ukrainians. and will not restore the natural gas subsidies to Kiev. and charge more for natural gas to Kiev. Kiev should better start pumping gas for themselves. CIA created a scornful monster. Some Crusade this is turning out to be. Not one country has the lion-heart to take this up. a lot of ridiculous things to prop up the members. His is the effort to keep his job. The effort keeps getting funnier. NATO has no more excuse for being. The ISIS attacks just might be one. But no country would commit troops and tanks. are those that the West has alienated. What a Crusade this is turning out to be! Posted by cool_ambo on August 26th, 2014 | Comments Off on ISIS Created in Syria? It most probably was started in Syria as a group, but its elements started in Iraq. 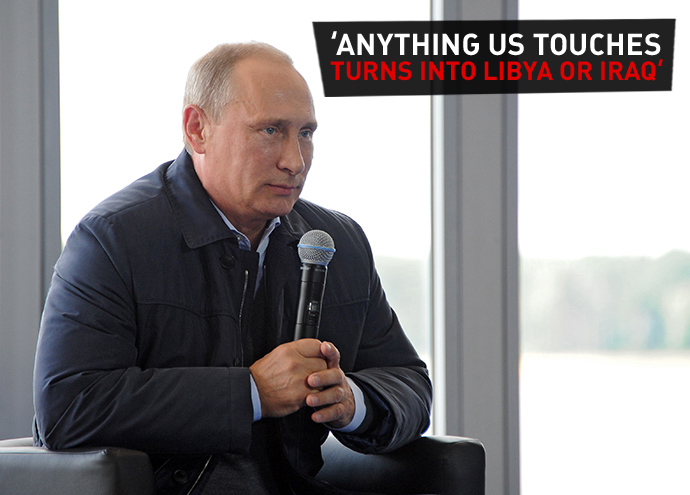 It then got dislodged and went to Libya to bring own Ghadaffi, and then to Syria to try to bring down Assad. The supply of weapons and provisions from the CIA dried up, and the advisers moved to Ukraine. What was left was a conglomeration of Muslims who are veterans of fighting against any ruling government. This time these elements secured their own provisions and finances. And then, what the heck, they formed their own army with finances, provisions, territory, and leadership. These people are voyeurs, adventurists, and gun-loving people with an adopted cause for Islam. If the rest of the Muslim world does not agree with ISIS and what it stands for, then these Muslims should also arm themselves and fight ISIS, or that Muslim group that is giving the rest of the Muslim world a bad name. Listen, Assad did not create ISIS. This was formed from the groups fighting Assad and which the CIA supplied arms with. In short, ISIS started from an abundant supply of American arms and finances. Also, flying reconnaissance over Syria may require permission from that government, otherwise some international incident may result from the intrusion. Let the Americans refrain from thinking that they own all the air space that they can fly on. The War against ISIS will be a popular war. And as such, Obama should pick up this effort. even get him to lead the charge. ever dreaming of Scheherazade and the Arabian Nights. did keep the jihadists in check within their domain. So thank Assad for fighting to keep his chair. Syrain has joined the ROTC. They are provided wthe free uniforms! Posted by cool_ambo on August 21st, 2014 | Comments Off on B-52’s to Iraq? as to the methods of fighting the ISIS. I would suggest falling back to the methods used in the Vietnam War. Which include carpet bombing with de-mothballed B-52’s. Also napalm bombs as Muslims seem to be afraid of fire. because of the foliage and vegetation. Iraq should be a land with little or none of trees growing. Hence carpet bombing will be very effective. I say again that the ISIS moves like a military unit. It has discipline within its ranks. And since this is so, it should have a Central Command. Either that, or the Central Command is mobile. It has actually been a step ahead of the US Intelligence. Notice that Bagdad is encircled and is under siege. for that time that they can install the Caliph of Bagdad. ISIS has, however, refrained from holding the high ground in daylight. It probably uses a series of caves for shelter. that is, if they can secure airplane maintenance men. But who is the fence? And once again this thing called civil strife threatens to dictate how justice is to be served. The Prosecutor himself is asked to step down for fear that his decision will be tainted, or his performance will be laid down. So therefore, whichever way he goes his actions will not be justifiable. Let me tell you about these sanctions against Russia again. It has turned from prayer to polarizer. further aligning themselves to beat the sanctions. the imports of agricultural products coming from the West. Now that should really hurt. I believe that there will be a war involving import bans. 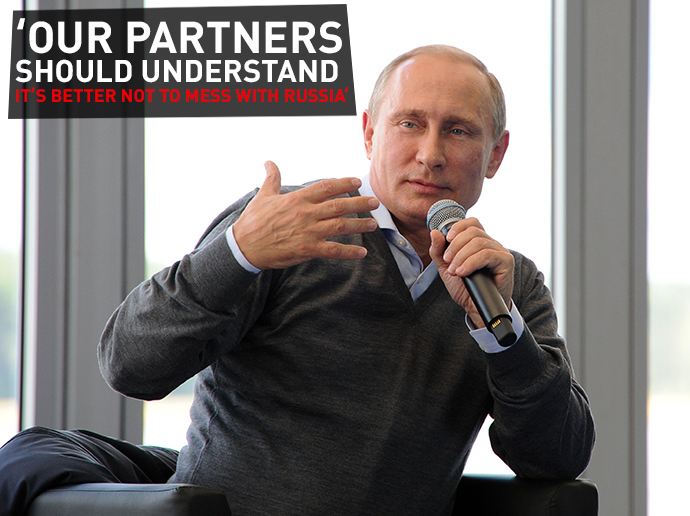 Putin has started throwing his punches. He has a headstart on Cuba, Africa, and the BRICS. What’s more, he owns the NORTH. The most widely used handgun was the .45 caliber Colt semi-automatic pistol. This was designed for the sole purpose of stopping a berserker Muslim Moro charge during Pershing’s time. It was standard issue for the military up to the Vietnam War. It was, however, heavy and loads only 7 rounds, plus another round in the chamber. But it could have stopped a charge towards a policeman from a heavy-set guy, like Michael Brown, with one or two shots. The newer standard issue Glock handgun used by policemen is light and loads about double the number of 9 mm rounds. But the football-tackle type of a rush will not be stopped unless the shot goes through the head. But let me talk about policemen. The badge issued anoints him to uphold the law, and concomitantly provides him with the authority to enforce the law. Needless to say the badge comes with the gun. This is to aid him in the enforcement of the law. It is not THE authority to enforce the law. The gun supports his functions, but only supports his function. He is not to use the gun as his authority to uphold the law. The policeman is trained in the legal repercussions after he discharges his gun. Much of this training goes to the subject of the do’s and the don’ts of shooting a person. There is the unwritten rule, however, and this rule is never mentioned nor dealt with amongst policemen. But I can guess what it is. In the American justice system, the judge and/or Jury, puts much consideration on the words of the witnesses. In fact, witnesses can change the picture of a trial. And now you guess who would be the ultimate witness on the stand : the victim himself. Considering this situation, it is a personal rule that when a policeman shoots a person, he makes sure that the person is shot dead. This way the main witness against him is eliminated. The situation in Ferguson has gone out of hand. And as a stock response, the country reels again in the never-ending conflict regarding discrimination. This will not work for this town, I mean raising the topic of racism again. This topic gives the Black Americans a leverage in the political and social innuendos obtaining, a leverage which is countered by the White Americans with disdain and hostility. Would that the Americans do away with color distinction and racial profiling and mistrust. They should start to be color-blind, ignore discrimination, it will eventually go away. so that they would have the liberty that they enjoy today? Protesters keep provoking the police in Ferguson. Somebody yanked a Do-Not-Enter Sign and displayed this in front of the police. Things were thrown at the police and that something ignited. So the police threw stun grenades and tear gas bombs. Street signs are property of the city and should not be yanked out. But the main thing is that this town has reverted back to the time of the civil strife. The protesters claim that the presence of the police create anxiety. What would it have created if the police were not present? We now see how things can get started—its the tension. The police cannot be blamed for this. They are ordered there to keep the peace, or stop a crowd from being unruly. There should be peace if the protesters disperse. Police now run after a group of about fifteen who may have fired some shots. Now the police move in to disperse the crowd. Program started on Sat, Aug 16 2014 at 11:06 PM. Analyzed requests from Mon, Apr 30 2012 at 5:10 AM to Sat, Aug 16 2014 at 11:06 PM (838.75 days). Figures in parentheses refer to the 7-day period ending Aug 16 2014 at 11:06 PM. African Americans, is the preferred name to distinguish the group of Black Americans, and yet these people never cease to deny their country of origin; which is the desolate, destitute and discredited continent of Africa. While they refuse to own the continent of Africa, they hesitate to integrate themselves fully to the American way of life; that is, that American way of life that is distinctively different and more civilized than the African way of life. Picture this image: Two black Americans, going in opposite directions on the same road, stop the cars they are driving, to chat in the middle of the road, side by side. And even though they are cognizant of the traffic being blocked both ways, they refuse to budge. This sort of lack of concern for the welfare of others and the blatant refusal to follow rules and regulations mark the attitude of these people. Such displays of selfishness and arrogance are common occurrence in hallways, and passageways, and queues. It is of no wonder that blacks will ignore orders from policemen and teachers and others of authority. It is a general attitude of a challenge to authority. Observe that all of the incidents involving policemen and blacks have the disregard to authority as the main cause of conflict. The root cause of this attitude, on the other hand, is that the African Americans are actually not satisfied of their being black. It is a natural disadvantage to be black in a country with white authorities. It would be difficult to be satisfied completely when one is black in America. Hence the lackadaisical attitude of black people as they retreat into a cocoon woven by the rest of the black community. This cocoon instills in their psyche that, since they are beleaguered and discriminated upon, they have the right to loot and disobey, and abuse the right of free movement. This is what I term the right to abuse. It still is, however, an abuse of freedom. Black people, or more specifically, African Americans, should learn to stop when the police tell them to stop; to follow rules and regulations; and talk civilly to people who are talking to them. Toeing the line is not a bad thing to do. It is not dehumanizing. It actually provides man the integrity and the bravado to communicate with people who are of a higher stature. Let the paranoid blacks stop their incessant complaint against the authority and learn to follow rules for once. They will gain the respect and the dignity that is due them if they do. There should be 14 legs. I counted only 13.